There’s absolutely nothing ordinary about the “Land of the Rising Sun”. In fact, it’s very extraordinary. It’s impossible to pigeonhole a country which has 21st century soaring skyscrapers and a high-tech bullet train sitting alongside traditional Geisha and the rituals of the tea ceremony. And then, there’s the fact that this “tiny” race loves Sumo wrestling, where some of the “biggest” men on the planet compete. There’s perhaps nowhere in the world that blends the old with the new quite like this intoxicating country. Tokyo is a sophisticated, larger than life city that simply dazzles. Busy with a capital “B”, as you’d expect from one that is home to 13 million people, the over used word “contrast” is entirely apt in relation to Tokyo. The entertainment district of Shinjuku is filled with soaring skyscrapers, garish neon lights and crowds of people wearing way-out fashions; but, turn a figurative corner and you’ll find stillness in the Senso-ji temple in Asakura or tranquillity in the Hamarikyu-en Garden. To the west of Tokyo lies the Hakone National Park with Mount Fuji, at its heart. It’s said that a wise man climbs Mount Fuji once in his life, but only a fool climbs it twice. On a clear day you can drink in the imposing views of this iconic mountain and savour the spectacular scenery as well as perhaps, enjoying the chance to soak in a soothing hot spring. Whilst in Hakone stay in traditional ryokan accommodation during which you’ll dine on a sumptuous multi-course meal whilst wearing a kimono before bedding down for the night on a futon. While Japan’s former capital, Kyoto, is a modern city it’s where your view of traditional Japan will be fulfilled. Crammed with grand palaces, decorative shrines and glorious gardens, it’s also where Geisha hobble down lamp-lit streets and young Japanese girls come to start their six year Geisha training as Maiko. Visit the Gion district to see them. Despite it’s tragic past, a visit to Hiroshima will not be a sad one, as a vibrant metropolis has risen from the ashes of the nuclear bomb which was dropped in 1945. Be sure to visit the Peace Memorial Park and the Cenotaph, under which the Peace Flame burns. Osaka is Japan’s commercial centre and also known as the City of Bridges - no surprise when you learn that it has almost a thousand of them, which are needed to cross the many miles of waterways. The most visited attraction is Osaka Castle, which although a replica, does afford amazing views from the top. Osaka is also one of Japan’s great food cities with many restaurants and food stalls found particularly in the entertainment district of Dotonbori. The modern city of Kanazawa is best known for Kenrokuen, a castle garden dating from the 17th century. Six elements comprise the perfect Japanese garden and this one is a prime example! Further insights to Japan’s traditional side are found in Takayama, a charming old world town lying in the midst of the northern alps’ snow-capped mountains. Alternatively visit Koysa-San, which is the mountain home of the Shingon sect of Buddhism. Home to over 100 temples it is one of Japan’s holiest sites and to spend a night in one of the temples is the quintessential Japanese experience. Nara, Japan’s former capital, belongs to an era before Zen gardens and tea ceremonies. It’s greatest draw is the monumental bronze Buddha of Todai-ji as well as the tranquil expanse of the surrounding deer park. Wherever your travels in Japan take you, a fascinating experience awaits you, so let Premier Holidays create the perfect holiday for you…. Our vastly experienced travel advisors are passionate about Japan. With first-hand knowledge of when and where to go they can create the perfect holiday experience for you, at the best possible price. 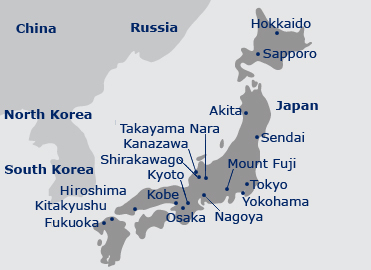 Flight duration: Tokyo is approximately 12 hours (non-stop flights) from the UK. Recommended airlines flying non-stop from the UK to Tokyo: British Airways & Virgin Atlantic. Recommended airlines that fly indirectly from the UK to Japan: Air France (via Paris), Emirates (via Dubai), Etihad Airways (via Abu Dhabi), KLM (via Amsterdam), Malaysia Airlines (via Kuala Lumpur), Qatar Airways (via Doha) & Singapore Airlines (via Singapore). Local time: GMT +9 hours. Language: Japanese. However, in most tourist areas you will find that some English is spoken and signs will also be displayed in roman script, although you may have to look for them! Passports & visas: A full British passport, which is machine readable and valid for six months beyond your return date is required. Health: Vaccinations may be required and are strongly recommended. Your GP will be able to provide you with specific advice on the destinations in your itinerary. Best time to travel: Japan�s four seasons resemble our own, but tend to be significantly colder and snowier during the winter (December to March) and much hotter in the summer (June to September). Spring and autumn are considered the best times to travel, as the weather is generally mild and there are spectacular views of the delicate spring cherry blossom or autumn foliage. June and early July is the main rainy season.